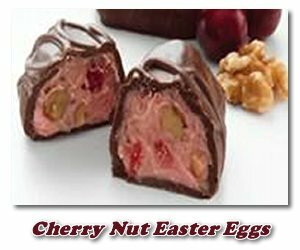 Chocolate Cherry Nut Easter Eggs are a wonderful choice if you want to make something a little bit special this Easter. Back in the day, you used to be able to pick up these little gems at Fannie May Candies, but I haven't seen them there recently. They do have a Fruit & Nut Easter Egg in their Easter Egg Box collection. It looks very similar, so perhaps they just changed the name? In fact, I've had a good look around and haven't been able to locate them anywhere else this year either, so if you are keen to buy a chocolate cherry nut Easter egg, I'd give that Fannie May version a try. Not to worry though! There is no reason why you can't make your own yummy cherry nut Easter eggs smothered in either milk, dark, or white chocolate - whatever your preference. There are a number of different Easter egg candy recipes, but this one I'm including below is particularly nice with the pieces of cherries all through it. Mmmm! This Easter egg recipe is versatile, too, so if you have some folks that don't like nuts in their candy, you can simply leave them out. Once you've made a batch, you can experiment with various combinations and create your own unique family favorite. Cut cherries in half and drain well on paper towels. Combine milk, butter, and pudding in a saucepan and cook over low heat, stirring until well blended and thick. Remove from heat and stir in cherries and nuts. Gradually add powdered sugar until mixture becomes firm enough to shape well. Coat hands with butter and form mixture into egg shapes. Place on waxed paper covered tray and chill for a couple hours until firm. Melt chocolate over double boiler or in microwave. Do not overheat. If you use the microwave, stir every 30 seconds until smooth. Dip eggs in melted chocolate and return to waxed paper to set. After covering the eggs in chocolate you can decorate them with candy confetti of different colors or shapes. You could also choose to decorate the egg with a butter cream icing and decorating tips. For a great price on these supplies visit Candyland Crafts.